Director – John G. Avildsen, Screenplay/Producer – Steve Shagan, Based on His Novel, Photography – James Crabe, Music – Bill Conti, Special Effects – Richard Richtsfeld, Production Design – Herman A. Blumenthal. Production Company – MGM/CIP Filmproduktions GmbH. LAPD detective Barney Caine is asked to investigate after former detective Tom Neeley is found murdered in his own home. Caine investigates Neeley’s employer, oil tycoon Adam Steiffel. The case takes him to West Berlin where he follows a series of clues on the trail of important documents confiscated from the Nazis at the end of World War II. However, every witness that Caine talks to ends up murdered shortly after. Caine discovers that he is on the path of a formula discovered by the Nazis that allows the conversion of coal into a cheap synthetic fuel – a secret that the oil companies are seeking to quash. Nazis have always held endless possibilities as B movie villains – see the cheapo genre likes of She Demons (1958), The Flesh Eaters (1964), They Saved Hitler’s Brain (1964), The Frozen Dead (1966), Flesh Feast (1970) and Death Ship (1980). Horror also gave us the Nazi zombie film beginning with Shock Waves (1977) and carrying on through Oasis of the Zombies (1981), Zombies Lake (1981), Night of the Zombies (1981), Outpost (2007) and sequels and Dead Snow (2009), not to mention the nasty Ilsa movies beginning with Ilsa, She Wolf of the S.S. (1974). This gave way to a fad for big-budget thrillers in the 1970s spun out around international locations and featuring Nazi villains with the likes of Marathon Man (1976), Voyage of the Damned (1976), Bear Island (1979), Eye of the Needle (1981) and especially The Boys from Brazil (1978). In more recent years, we have seen a revival of the Nazi villain in what might be termed a spate of gonzo Nazi films with the likes of Iron Sky (2012), Nazis at the Center of the Earth (2012) and The 25th Reich (2012). The Formula comes from Steve Shagan, a writer and producer who had delivered scripts for films like Save the Tiger (1973), the abovementioned Voyage of the Damned, Nightwing (1979) and the subsequent Primal Fear (1996), as well as having produced the Ron Ely Tarzan (1966-8) tv series and the interesting horror tv movie Sole Survivor (1970). Shagan also wrote several novels and first developed the script here out as a novel The Formula (1979). Shagan handed the director’s chair over to John G. Avildsen who had made Save the Tiger and was then riding on the success of the first Rocky (1976). Avildsen directed the other big hit of The Karate Kid (1984) shortly after but never did much beyond directing Rocky and Karate Kid sequels. His last moderate hit was the banal Bryce Courtenay adaptation The Power of One (1992). The Formula flopped at the box-office and was not widely seen. Indeed, it received four Golden Raspberry Award nominations that year, including for Worst Picture, Worst Director and Marlon Brando for Worst Actor. The Formula feels like it was made to cash-in on The Boys from Brazil. 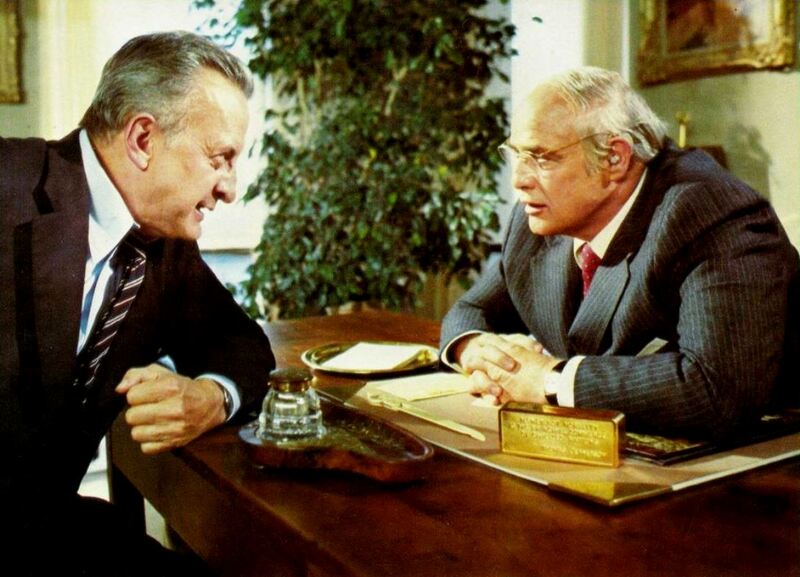 It offers a similar Nazi thriller plot that showcases the attempts of two name actors, George C. Scott and Marlon Brando, to out-overact one another. Aging warhorse Scott plays with granite doggedness and not a moment of conviction – “Check this against his hand writing,” he orders upon finding a piece of newspaper next to a body scrawled in the victim’s blood. 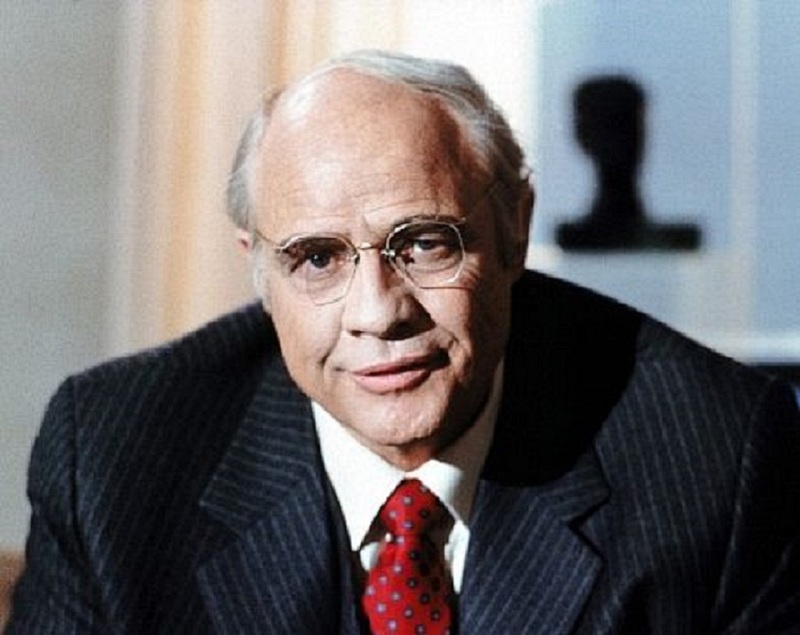 By the 1980s, Marlon Brando gave the impression he had stopped caring about acting – he was the highest paid actor in the world and could claim $2.75 million for just turning up for a total of three scenes here. Cast as a brassy Texan oilman, the overweight Brando goes through his Method Acting thing – scratching his head, mumbling and stumbling his way through his dialogue while outfitted with a set of false teeth – and is terrible. Steve Shagan was clearly trying to create a topical thriller set around the world of 1970s Big Oil – the decade when OPEC was starting to exert its hold on world markets and jack up gasoline prices. It feels though almost like a topic that was far too large for the film to ever adequately grasp – and so Shagan raises it and then leaves it alone. There is little credibility to a plot that, in every single case, has to have its supporting characters deliver vital pieces of information just before being killed. 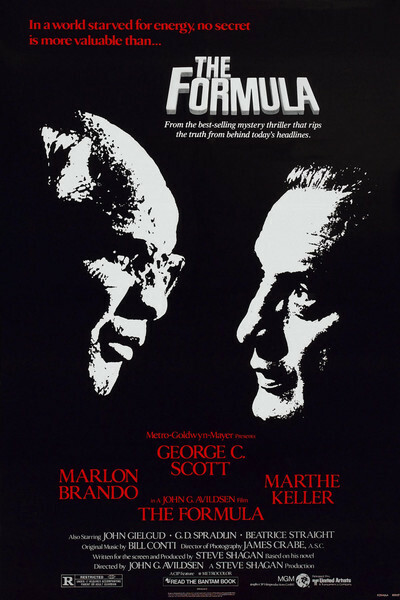 The machinations of Brando’s character are never made particularly clear .The film fades out at on an irresolution where George C. Scott and Marlon Brando meet in Brando’s office and grunt and glower at one another while Brando explains his villainous scheme that doesn’t make a whole lot of sense.